​These past two weeks we have been very focused on expanding our gardens and getting seeds in the ground including garlic, onions, kale, spinach, etc. Also, we have been focusing on planting additional fruit trees and bushes. We are very excited to see what grows throughout the spring and summer and look forward to sharing our bounty with our customers. We also have begun welcoming volunteers from the WWOOF USA program again this year. We currently have a girl from Austria who will be staying with us for two weeks. Having additional help even for a few weeks can make a huge difference. It is also great to meet new people and hear about their life experiences and allow our children to experience different languages, cultures and norms. We have also been adapting to life with two kids and have been enjoying seeing Willow and Henry bond. There have been many sleepless nights in our household but with each new day we get a bit closer to a better schedule. This crazy weather has really been keeping us on our toes. With all of the rain, it has made our property very muddy so we have had to be very strategic in how/where we move our animals, where we drive and even where we walk. We want to ensure that we protect our animals and our land at the same time so it takes a lot of planning to ensure we do things right. At the same time, we are enjoying our son Henry and watching how much Willow loves having him around. He is very calm and easy going so that has made the transition a bit more smooth. Also, we have been finalizing the curriculum for our Chainsaw Safety Course which will take place this upcoming weekend. If you are interested and haven't yet signed up, be sure to do so soon as the spots are filling up quickly. Details can be found here. ​This past weekend has been an amazing weekend as we had the privilege to welcome Henry Rowan Bowen to the Nature’s Roots Farm family. Weighing 8 lbs 8 oz and measuring 21.25 inches Henry entered the world at 0131 am on the 28th of January at the Chapel Hill Birthing Center. Angela powered through the natural birthing process and did an amazing job the entire time. Angela and Henry are doing great and both are very healthy. 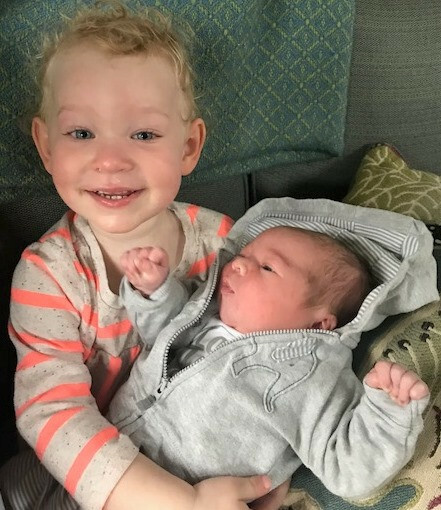 Willow has also been super excited as she is now a “big sister”. We had amazing support from both sides of our family this past weekend and want to thank all of you for sending us positive thoughts and prayers.